Sleeping on It could Help Solve Problems! Have you been working hard to solve a problem? Are you feeling bogged down, or stuck trying to find an answer? 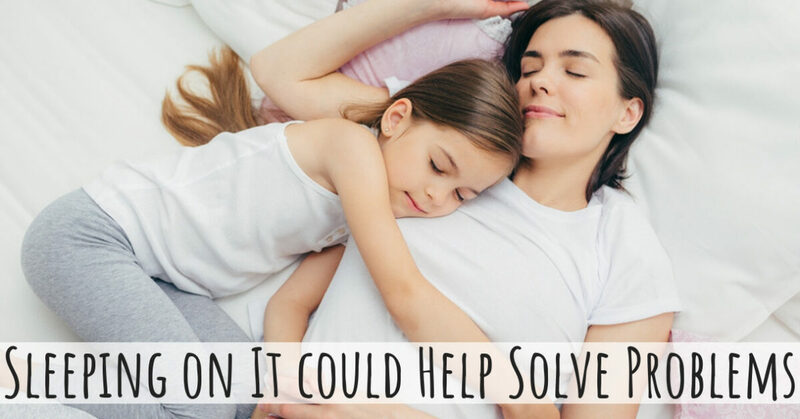 New research shows that sleeping on a difficult problem can actually help us solve our problems, and not only will you wake up refreshed with new energy to tackle the problem, your brain may have solved the problem during your sleep. A recent study from the Lancaster University in England shows that sleeping can help you solve problems. Rather than burning the midnight oil and struggling through fatigue to try to find a solution, next time you’re in a jam try turning out the light and getting a good night’s rest. Researchers at the University placed participants in two groups to get to the bottom of this theory that sleep helps you solve problems. One group, the ‘sleep’ group, were shown the problems in the evenings, then asked to solve them in the morning. The ‘wake’ group were shown the problems in the morning, then asked to solve them in the evening. While both groups were able to solve easy problems, the ‘sleep’ group dramatically outperformed the ‘wake’ group in their ability to solve more difficult problems and make the best decisions. Sleeping doesn’t just help you solve problems, it can also enhance your creativity for those tough decisions. Not all problems are black and white, and especially when it comes to more emotional issues, finding the right answer takes a lot of insight and creativity. For example, when you’re trying to come to a agreement with your spouse, or make decisions about how to give your children the best advice, you need to compromise, see the problem from all sides, and think creatively. Getting a good night’s sleep will help your brain rest and recover from the day. Researchers believe that during REM sleep, the deepest sleep stage, your brain is able to process events of the day, and form associations between seemingly unrelated ideas. You might wake up with fresh insights you didn’t think of during the day. Sara Mednick, PhD, from the University of California, San Diego, studies what happens to the hippocampus when we sleep. During the day, the hippocampus creates and stores memories, and these are all held in working memory throughout the day. When you sleep, these memories are transferred to the neocortex, and enter long term memory. Mednick explains that “once a memory or experience reaches the neocortex, it can be associated with all the other memories.” This reorganizes the memories, and forms links we might not have realized during the day. This is why sleeping on a problem can actually help you find a solution in the morning, or at least look at the problem in a different light. Are you struggling to get a good night’s sleep? Is this having a negative impact on your problem solving or creativity? If you’re not sleeping well, try some of these sleeping tips. Make sure your room is dark, a comfortable temperature, and free of background noises or distractions. Find out what pillow is right for you, based on your sleep position. Having the wrong pillow can cause discomfort, and wake you up during the night. Turn off your phone or TV an hour before bed and pick up a book. The blue light from your screens is likely to keep you awake, and making it harder to fall asleep. Ready to enhance your sleep, and improve your creative problem solving? Call us today at Sound Sleep Medical for a consultation and find out other ways you can improve your sleep, whether it’s rearranging your bedroom furniture or treating a sleep condition like sleep apnea. Whatever the cause of your sleepless nights, we’ll help you get back on track with your sleep.